(Bloomberg Opinion) -- Truly independent central banks are beginning to look like an endangered species. Donald Trump continued to hammer his Federal Reserve chairman over the weekend, even as European Central Bank President Mario Draghi worried aloud about the U.S. president’s Twitter assaults. National leaders from India to Turkey have exerted immense pressure to bend monetary policy more to their liking. One of the central banks resisting most fiercely is also one of the most unlikely: the People’s Bank of China. Of course, no one pretends that the PBOC isn’t subservient to China’s Communist leaders. But the Chinese central bank, trying to wring out excessive borrowing and worried about reemerging asset bubbles, has done a more-than-creditable job at fending off pressure to ease its policy stance in recent weeks. The question is how long it can keep up the fight. Its efforts can be seen most clearly in the bond market. 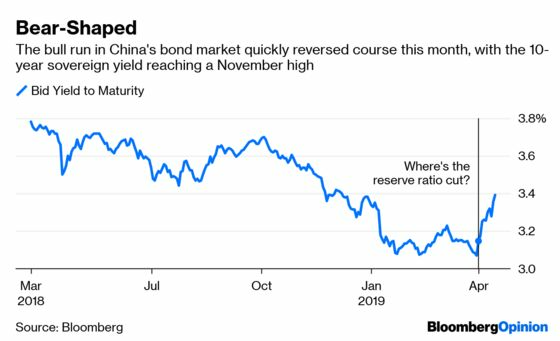 Just two weeks ago, traders were betting that China’s 10-year sovereign bond yield would dip below 3 percent this year, a level it last reached in 2016 when the country was battling deflation. Since the beginning of April, though, the bond bull run has reversed course. On Monday, the benchmark yield rose to its November high. The PBOC is largely to blame. Traders have been hoping for more easing ever since the central bank announced a reserve ratio cut on Jan. 4. A much-anticipated move lower, expected April 1, didn’t materialize. Even worse, the PBOC has skipped open-market operations for 18 consecutive days, saying there’s ample liquidity in the banking system. The central bank has a point: Total social financing jumped to 8.2 trillion yuan ($1.2 trillion) in the first quarter, versus 5.9 trillion yuan a year ago. The PBOC’s sobriety has earned it some powerful enemies, most notably China’s Ministry of Finance. In an effort to prod the economy, the ministry is looking for new ways to pay for stimulus packages off the fiscal books. It’s focused in particular on issuing local government special-purpose bonds, used mainly to fund infrastructure projects. 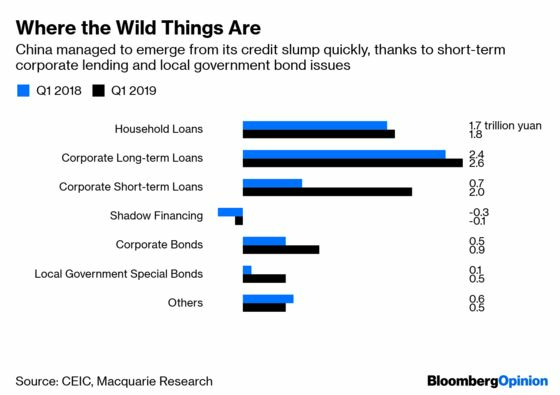 In the first quarter, out of the 2.3 trillion yuan increase in total social credit, 1.3 trillion yuan came from short-term corporate lending -- probably due to pressure from the PBOC on banks to lend as much as possible -- and another 462 billion yuan from new issuance of such municipal bonds. China plans to sell 2.15 trillion yuan worth of these bonds this year, up from 1.9 trillion yuan issued in 2018. For the bond market to absorb so much new supply, yields need to be heading down not up. The Ministry of Finance has a very tight carry guidance: Municipal bonds aren’t supposed to pay more than 25 basis points to 40 basis points beyond sovereign issues of the same tenor. So there’s little incentive for investors to buy unless they see a broad bond market rally. Desperate for money, local governments are hamstrung. Inner Mongolia offered investors a 50 basis point yield premium in its sale of 10-year notes last week, the first deal to price outside the Ministry of Finance’s suggested premium range. The central bank almost certainly knows it’s complicating the ministry’s plans. But, so far at least, its concerns take precedence. 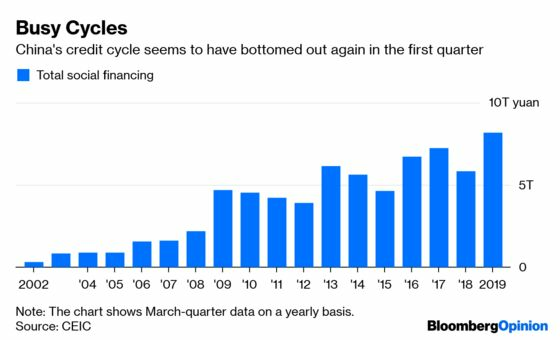 In the past decade, China has experienced at least three big credit cycles. The government issued a 4 trillion yuan stimulus after the collapse of Lehman Brothers, then local government financial vehicles bloomed in the summer of 2012, and finally the central bank’s own interest rate cuts in late 2014 boosted lending. All three episodes saddled China with massive debt, much of it landing on the banks’ books. 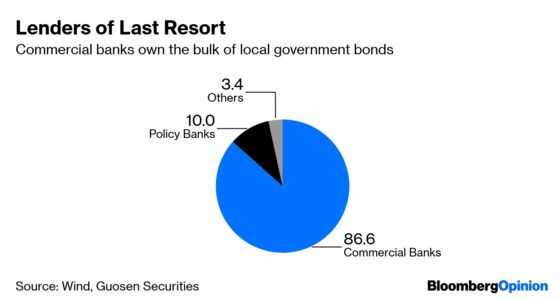 And who owns the bulk of the new special-purpose municipal bonds? Banks again. Given the rise in non-performing loans, the PBOC is understandably leery of adding to that pile. The chances of the PBOC continuing to resist such pressure are slim. Less than two years ago, the central bank had another ugly, much more public fight with the Ministry of Finance -- and had to relent in the end. Its days as a bastion of independence may be numbered.